George Bernard Symes was born on August 3rd 1872. He was the eldest of the four children of Bernard and Laura Symes. On 4th January 1884 he was admitted to Thornbury Grammar School under the name of ‘Bernard Symes’. After being brought up at his parents home at Jubilee House, Gillingstool, George followed in his father’s footsteps in becoming a tailor. By the census of 1891 he had moved to London, boarding in Boyson Road, Newington where he was training as a tailor’s cutter. In 1899 he married Sarah Ann Bishop Coates in Chippenham, known as Annie. Later census records shows ‘Annie’ was born in Corsham in Wiltshire about 1875. Unfortunately in the 1881 and 1891 census Annie was visiting other families so we can’t trace her parentage. In the census of 1901 George Bernard Symes was a tailor in the High Street with his wife Annie. The 1899 rate book and the 1901 census indicate that the Symes tailoring shop was initially at 41 High Street in the building where the Barclays Bank is now located. He was renting the property from Henry Anstey. 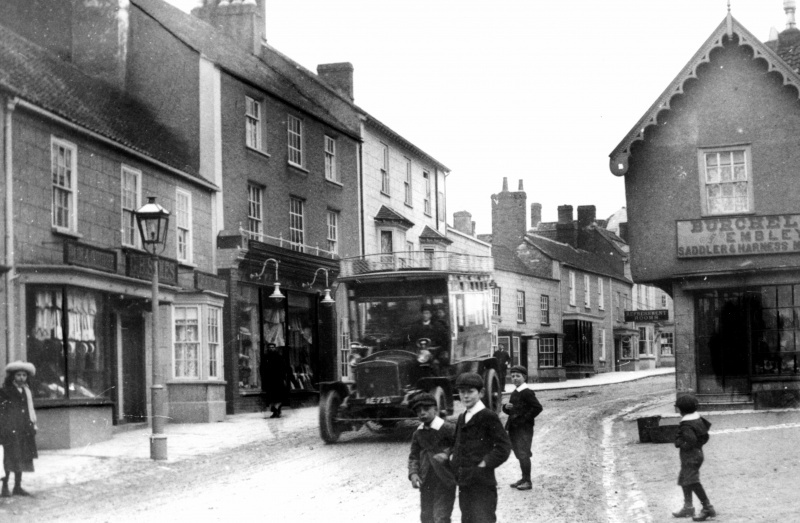 The photograph on the right was taken about 1906 and shows the shop by the lamp post. The 1907 rate book shows that GB had bought the property next at 39 High Street (where the Oxfam shop is currently located) and he had moved his business there. He had also became the owner of Gillingstool Cottage. We know something about his tailoring business from the applications for exemption from service in World War I. In the application on behalf of Arthur Allen, George Bernard says that he employed eight men and that Arthur was a foreman and during his absences from the business acted on his behalf. The war meant that four of the staff were called up and George Bernard was attempting to retain Arthur Allen as a much needed employee. GB’s business continued to be run from 39 High Street, but by 1925 he had also become the owner of the property next door, number 37, which he let out to Alfred George Excell. We have also been told that in the 1930s George moved to live at 55 High Street, possibly after he retired from the shop. George Bernard also played a very active part in the running of the town, serving on the District Council for 21 years having been appointed in 1913. He was Chairman of the Finance Committee for his last 10 years of his life. He was also on the old Board of Guardians and Guardians Committee, a Vice-Chairman of the Governors of the Thornbury Grammar School and Chairman of the Managers of the Council School and a Justice of the Peace since 1924. He loved music and had been a member of the Thornbury Gleemen for 40 years and been their chairman for 20 years. The photograph of G B Symes above left is copied from a photograph of the gleemen. George died 1st April 1935 aged 63 years. His estate was valued at £6,706 9s 6d. He left £50 to Arthur Allen and £25 to Archibald Harold Symes providing that they were still in his employ. He left £1,000 and his household and personal effects to his wife. The residue of his estate he left in trust for his wife and then £100 was to go to the Thornbury Congregational Church and the residue to be divided amongst his sister’s children. The couple had had no children of their own. His funeral took place at the Congregational Church of which he had been a deacon and treasurer for many years. Sarah Annie died on 23rd November 1947 aged 74. The service was held at Sneyd Park Congregational Church and was buried in Thornbury Cemetery on 27th November. The property at 39 High Street was put up for auction on 25th February 1948 so it was still owned by George’s estate up until that time.